Alberto Contador took yesterday’s stage and it looks like the race for the red jersey is over. The climbing isn’t and today presents a sharp summit finish. Revenge for Chris Froome, confirmation for Contador or the chance for a new name to emerge. A clear win for Alberto Contador who was dropped into place by his Tinkoff-Saxo team with Ivan Basso the last to set the pace before the Spaniard took off. In fact Basso’s pace was so strong he’d towed Contador clear with only a few riders able to follow. Then Contador went clear, he appeared to be checking his power meter a lot initially but it later turned out to be faulty, he blamed interference from TV signals. The move was vintage Contador, he can be impossible to follow but doesn’t keep riding away, he gets a gap then manages and preserves the lead. Yesterday he took 30 seconds within one kilometre – although the TV time captions were off at times – and maintained this advantage most of the way up the long climb. Behind Sky’s Peter Kennaugh was leading the chase with Romain Bardet behind and initially Froome was nowhere to be seen, at least on TV. But Froome came past the others. Contador was clearly superior but Froome’s time for the climb will have been close. As the profile shows there’s another summit finish. This one is shorter than yesterday but has 3.5km at over 10%, one for the pure climbers again. See altimetras.net for the full profile. Yesterday’s climb helped establish a hierarchy to the race and today it’s likely riders far down on GC are given some more leeway: Tinkoff-Saxo can contain the race but don’t need to neutralise everyone. Contador is still the obvious pick, this time he only needs to track Chris Froome and then pip in the sprint. The shorter climb should suit Romain Bardet more and Tim Wellens too. Weather: cloudy with rain at times and a top temperature of 10°C with a light crosswind for the long approach to the final climb. 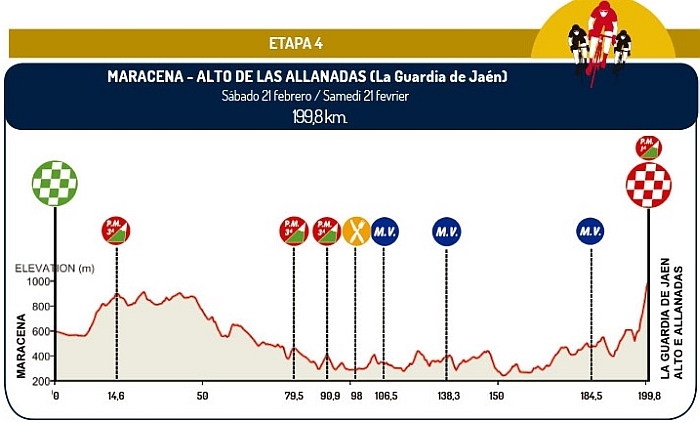 TV: live on Eurosport with the finish forecast for around 3.45pm. Tune by 3.00pm to watch them approach the climb. For more viewing options, as ever cyclingfans.com and steephill.tv have links to live feeds. Alberto was regal today, though Froome was best of the rest by a long shot, too. Cool to have HC racing so early in the season. Such a treat compared to the flat boring sand dune stages that have infested The early season. The action in the crosswinds is good although reserved for classics fans who want something extra. But yesterday in Oman wasn’t flat at all and today, sandstorms permitted, isn’t either, a very tough climb too. But it’s not on TV. RoboBasso returns by riding everyone in the WT off their wheel. Hmm. Something sure sounds familiar about that but I can’t quite put my finger on it. Since returning from his ban Basso is famous for being able to ride at a fast tempo uphill, yesterday he blew after a kilometre, the suspicion would be if he followed Contador all the way up, just like he did with Armstrong. If he’s up to know good he’s not very good at it. Isn’t that the same Basso who was dumped by a certain DS when things got a bit tricky? Now they are reunited and IB looks like he could go up the Zoncolan on 52×11. That DS must have found a way to inspire him again…. I thought Basso had run out of steam years ago, seems I was wrong. I thought Nieve did brilliant yesterday to ride from last at the bottom of the climb to finish 5th.. He might be given the nod today to attack if his legs are that good, I think he could win today. 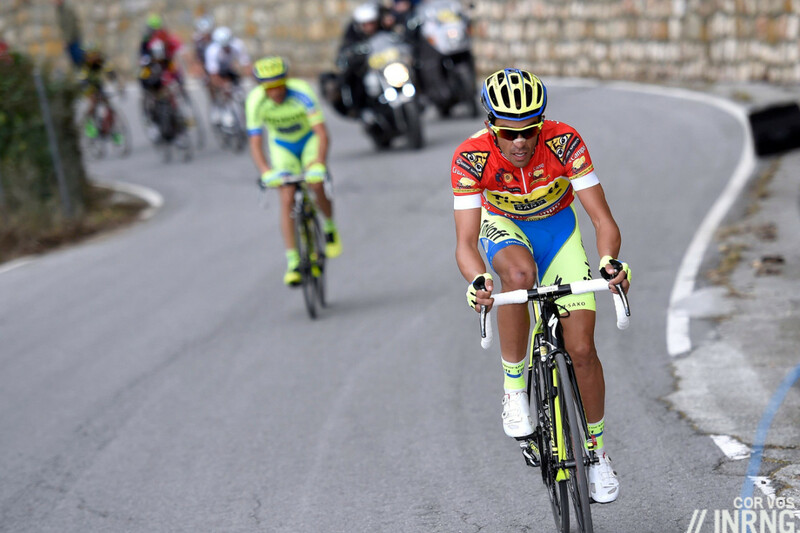 Contador could win but does he need to put himself in to the red so early in the season? He can just mark and follow today..
Nearly right. He tried to mark… but he couldn’t follow! Nicolas Edet still in the top ten, with only one stage left to go. Very nice.